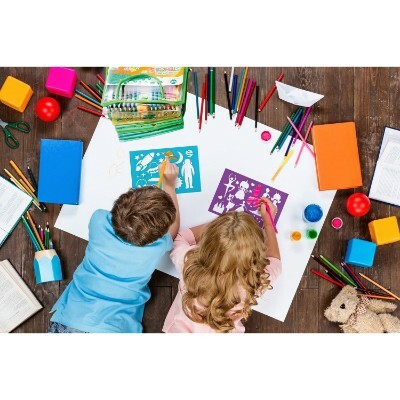 Encouraging your child to unleash their imagination and creativity in the form of arts and crafts will stimulate their development in a variety of ways. Gripping a paintbrush, pencil, or crayon will increase their fine-motor skills and bilateral coordination. As they experiment with different mediums, they will increase their sensory skills as well as their cognitive thinking. Your child’s self-esteem levels will rise as they complete each craft. By working on the crafts with your child, you will not only bond with them but also improve their social skills. Children often use art as a form of self-expression and as a way to communicate their feelings, thus it is highly important that you give them free rein to create their pieces. Here's a list of the best 10 kits for children of all skill levels. All of them are guaranteed to be appropriate and will provide hours of fun. All of the colors are non-toxic and child safe. The set comes in a convenient carrying case. The carrying case has various storage compartments. This helps keep items organized. The storage compartment has a snap fit design, which is great for keeping their supplies neatly tight in their spot. Arts and crafts are a great way to foster a love of art in children all while developing fine-motor skills, cognitive ability and creative expression. Our recently updated list of the top 10 arts and crafts sets includes a couple of new products and all product information--contents, age ranges, availability and cost--have been reviewed and updated as necessary. The carrying case is a bit large. It won’t fit nicely into a backpack. What better way to help children connect with their past than by providing them with this quintessential coloring kit. The design is light enough for little ones to carry around and colors are made of the highest quality materials. In addition to having some of the most vibrant colors under the sun, these colors are also non-toxic and wash off clothing easily. This set has all the tools your artist needs to express themselves while helping them stay organized. Crayola is one of the most enduring makers of art supplies for kids, especially coloring instruments. We simply cannot imagine having graduated from grade school without ever getting our hands on the classic coloring cylindrical sticks of Crayola. Whether it is for doodling or for some serious artwork during one of our classes, we sure grew up with Crayola crayons in our hands. It comes with 64 signature crayons from Crayola, 20 pieces of Super Tips highly washable markers, and 20 pieces of Pip Squeaks skinny markers that are also washable. Both markers come with a versatile tip designed to draw either thick or thin lines depending on whether your kid uses the Super Tips or the Pip Squeaks, respectively. The kit also comes with 18 pieces of colored pencils and 25 sheets of drawing paper so your kid can go on creating his or her own colorful masterpieces at once. There’s even a pair of safety scissors thrown in. The colored pencils are perfect for outlines, faces, or even soft-toned shapes. And since the markers’ ink is washable, you don’t have to fret about the pigments staining your kid’s shirt. Today, Crayola is giving the same creative joys we once had to many young children, hoping to inspire them to be creative and let their imagination fly through the roof. 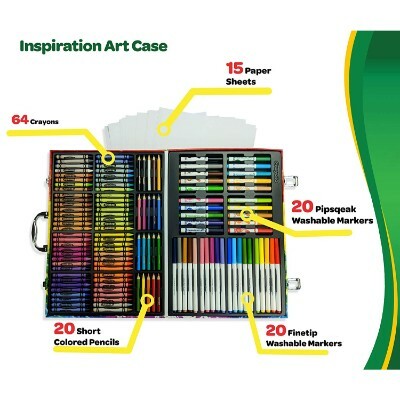 Crayola’s Inspiration Art Case is something that is truly representative of the company’s penchant for high-quality coloring products in an elegantly styled carrying case. This beautiful case is sturdy and has a place for everything built into it. The wooden case includes a removable drawer. This set comes with pencils, watercolors, and crayons. But it also includes a very neatly colored chart, sharpeners, and erasers. The convenient mixing pallet is a great tool to have when working with paints. Warning: Choking hazard due to small parts. This set is not recommended for children under 3 years old. The crayons in the drawer tend to get jumbled up during shipping. It’s probably best to get insurance or a warranty. When your Rembrandt is ready to expand their creative horizons, they might be ready for this massive art kit. 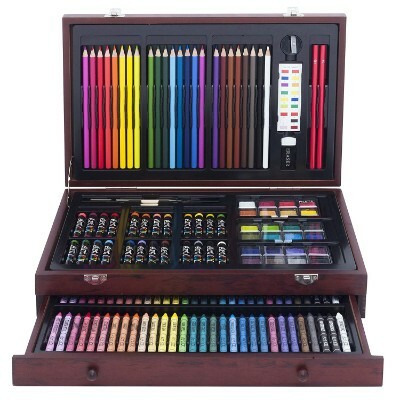 This finely crafted wooden kit comes complete with 24 oil pastels,24 watercolors, 24 colored pencils, and 60 vibrant crayons plus eraser, sharpener and color chart! 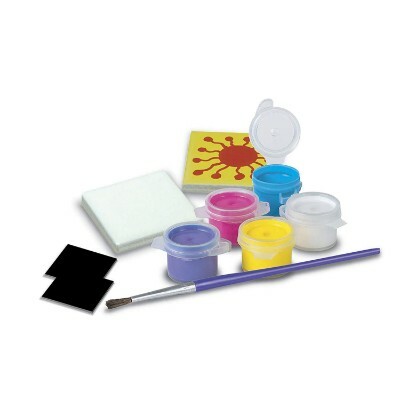 Included are 3 color mixing pallets and two brushes so your child will always be ready when inspiration strikes. Help your child push past their blue phase and into a vibrant world of art with this amazing set. 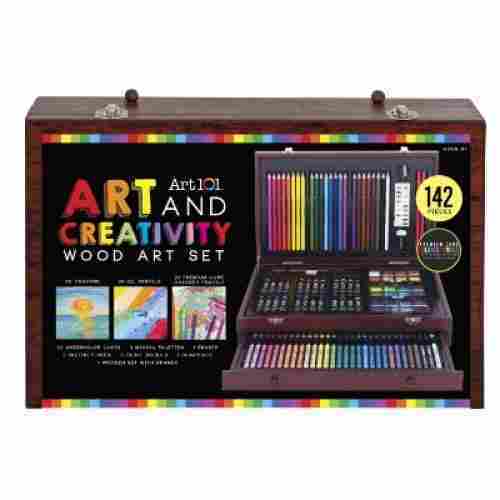 While not really as popular as Crayola, we’d have to say the 142-Piece Wood Art Set wins by a mile if we are going to look at the luxury look and feel of its elegantly designed wooden organizer. You would think that this is some really expensive gem you’re storing and not some drawing kits for your kids. 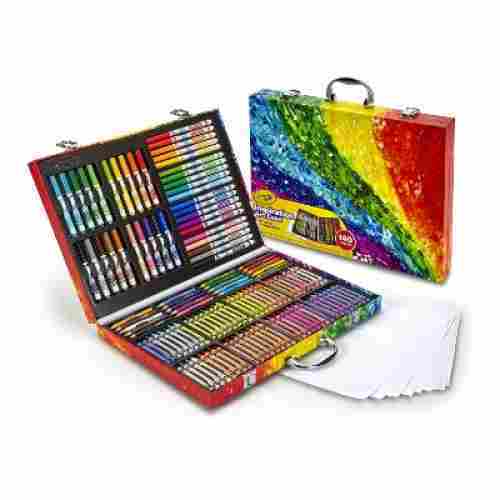 But this set clearly has the goods to provide young artists the medium for creativity. It contains 60 pieces of vibrant colored crayons, 24 sticks of oil pastels, and 24 pieces of colored pencils. This trifecta of coloring instruments can already make for an excellent kit for any kid. It also included 24 cakes of watercolors complete with 3 mixing palettes and 2 paint brushes. This should add a certain element of watery lightness to your child’s masterpiece. To help in refining his or her creations, the company also threw in 2 pieces of sketching pencils, perfect for making drafts and lines before finishing them up with the rest of the coloring tools. There’s also a color chart to help kids combine a variety of colors to achieve the kind of effect that he or she wants. 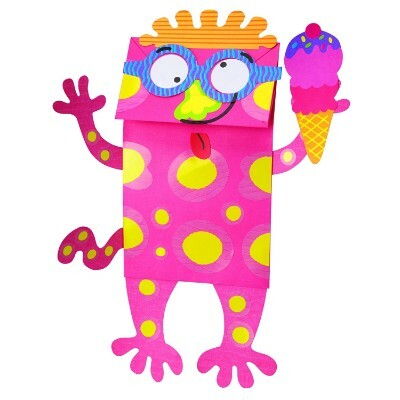 This product offers an inventive new way for your child to create and display their drawings. Once your child is done painting the tile, they simply attach a magnet on the back and place them on any metal surface for display. Your fridge, locker, or filing cabinet will instantly become more glamorous. 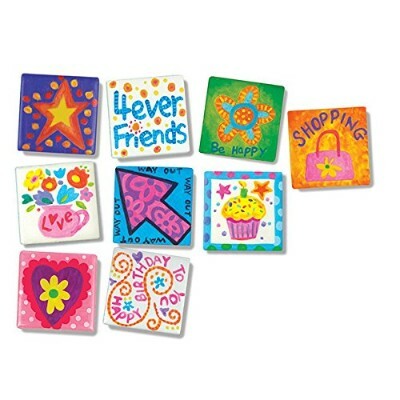 Children ages 8 and up will have a blast painting their tiles. The size of the tiles and the colors included will provide your child with a little bit of a challenge as they create their works of art. Your child will learn patience as they wait for their creations to dry. The adhesive on the magnets is highly durable thus guaranteeing that your child’s works will securely stay where they are placed. The fine-tipped paintbrush will allow your child to add small details to their pieces. 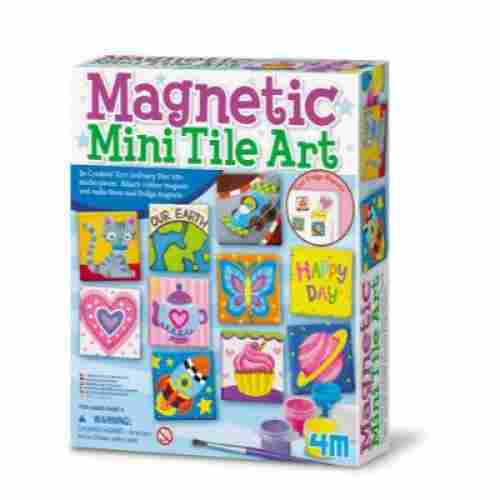 With 12 magnets included, your child can paint with their friends. Anytime you can give your children a chance to spread happiness and kindness it is a good time. 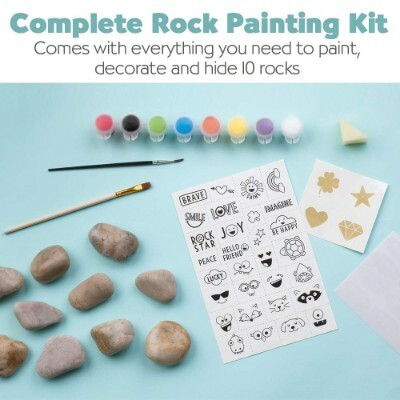 Leading my example is easy with this rock painting craft set. It is something the whole family can enjoy doing together. Allowing their creativity to be expressed through art is a wonderful outlet. Many kids find completing artwork calming. Rock painting is not only calming for the creator, but the finder will share the experience as well. This set comes with everything they need to create their own customized rocks. This set even includes 10 rocks. All the art supplies like the paint, design transfers, and stickers are waterproof. The stickers feature tracking information so that others can share on social media when they find them. 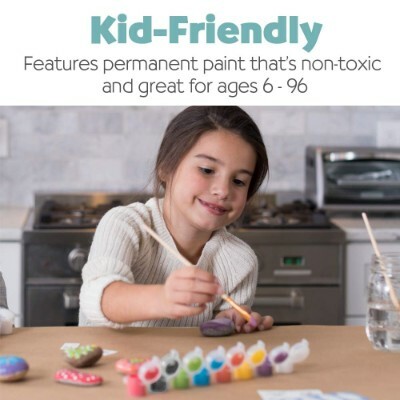 All the art supplies are non-toxic and safe for a wide variety of age groups. This stencil set is great to get them started on their artistic journey, or great way to help them create full scenes for class or personal projects. If you’re looking for the ultimate set of stencils for your kid, look no further than this product from Creativ’ Craft. They can use more 260 stencil templates with a variety of themes to create full scenes from their imaginations or create messages with perfect lettering. 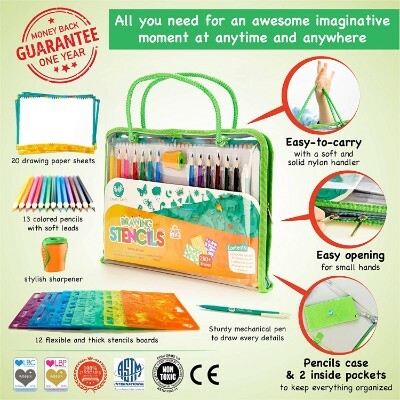 This product includes 13 coloring pencils, a sharpener, as well as a mechanical pen to get them started with their creations. 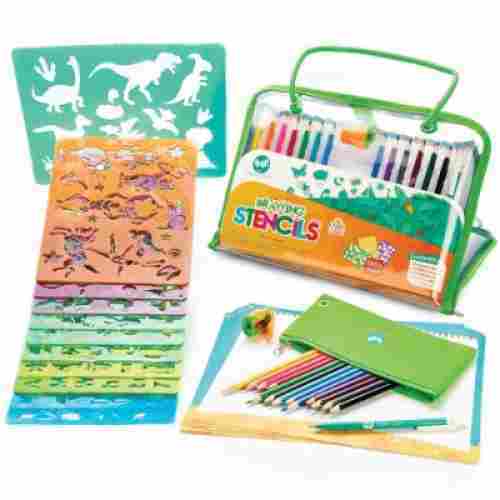 This set will teach them the basic forms of their favorite animals and plants, helping them to get better at drawing over time. The wide variety shapes will give them hours of constructive time creating scenes of ancient dinosaurs in their natural habitat, or constructing an underwater biome. These fun, scary monsters can continue to be used long after they’ve been created. Encourage your kids to put on a puppet show with them after to showcase their talents and show off what they’ve created! Paper bags no longer have to strictly be used for sack lunches. 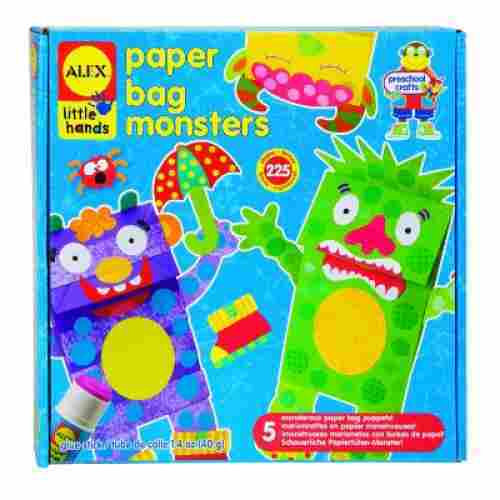 The ALEX Toys Little Hands Paper Bag Monsters kit has everything you need for your child to turn a classic paper bag into a colorful monster. There are more than 200 stickers, five paper bags, a glue stick, paper shapes, and easy-to-read instructions all included in this set. All of the bags are packaged separately so each one can easily be stored until your child is ready to craft. Children’s ages 3 and up will have no trouble following the step-by-step instructions as there is no reading required. Your little one will increase their fine-motor skills as they work to peel and place the stickers and glue on fun paper shapes. 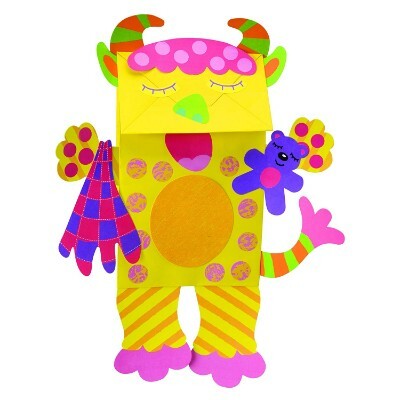 This craft will stimulate your child’s imagination and encourage them to engage in pretend play as they can place their hand inside the paper bag to bring their monster to life. This is a great kit for beginners as it teaches your child techniques that they can use in future projects. Due to its ease of use and no need for paint or a paintbrush, this craft would be perfect to take on long car rides or trips. It’s also fun for a quick after-school activity rather than TV time or playing video games. We all remember our first “stained glass” kit that was a cool design featuring plastic inserts that were able to be painted. When you held it up to the sun or a light source, it seemed to glow from within. 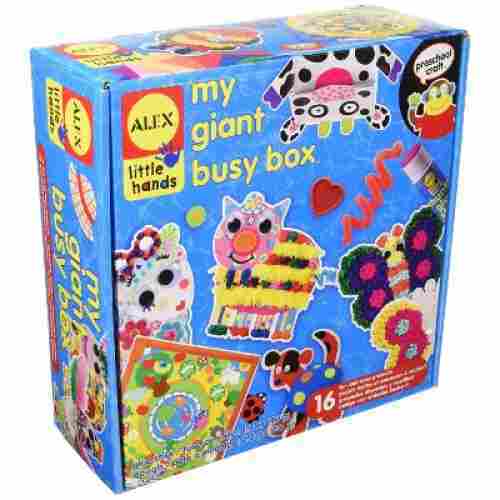 Melissa & Doug have created an updated version of this with a fun butterfly design as well as stickers rather than paint. 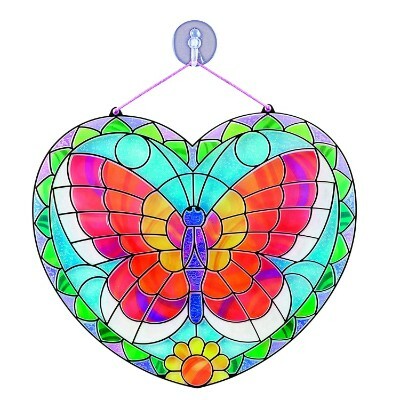 This craft couldn’t be simpler, just peel the stickers, press the colors where you want, and hang in the window to watch this butterfly come to life! 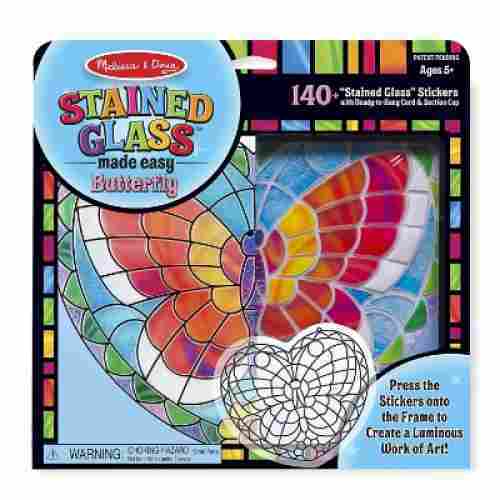 You no longer need to worry about your kids making a mess when they want to create stained glass art. Some psychedelic-looking stickers and a cute butterfly design, and they’ll be hanging up beautiful creations in no time. 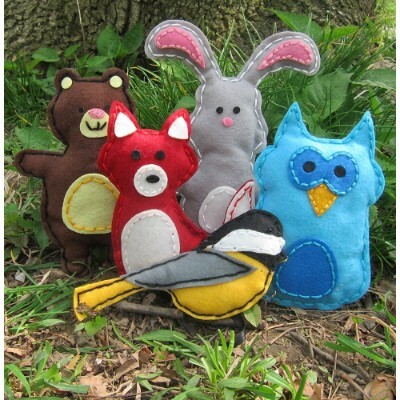 This is an easy and gentle way to help kids learn a sewing skill that will serve them well for the rest of their lives. 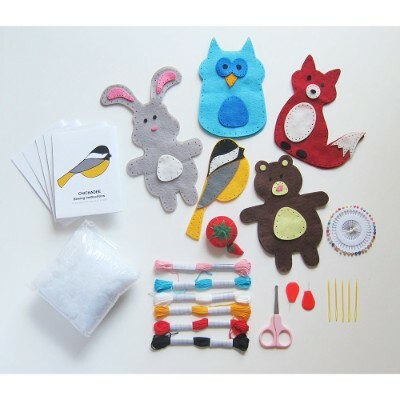 It’s also a unisex craft kit that would be perfect for both boys and girls to learn from. 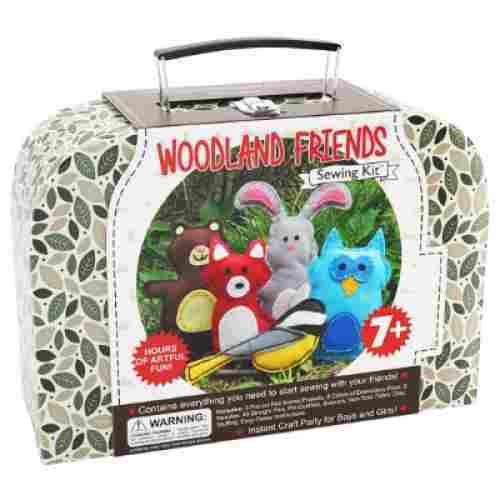 This kit is designed for more than one child and comes with a total of five sewing needs, as well as enough supplies for five different woodland creatures. It’s great for parties and celebrations and will allow kids to work together as well as help out while they learn a new skill. Additional kits can be purchased for groups larger than five. Sewing is one of those skills that you don’t realize is important until you need to hem your pants or reattach a button to your shirt. By teaching kids at a young age how to do these things, they’re more likely to remember -- especially if their first sewing project was a cute little animal! 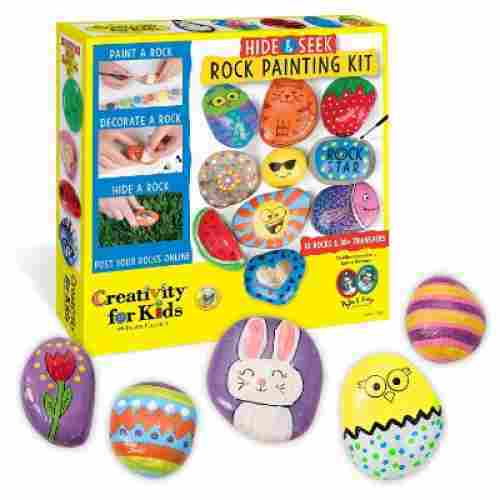 We love kits that also allow the kids the freedom to express themselves with a lot of different types of materials. This kit includes so many pieces and projects that it keeps them busy creating for hours. It is a great for rainy days activity or for a party. Keeping the young ones busy can sometimes be a great challenge, but not with this box. 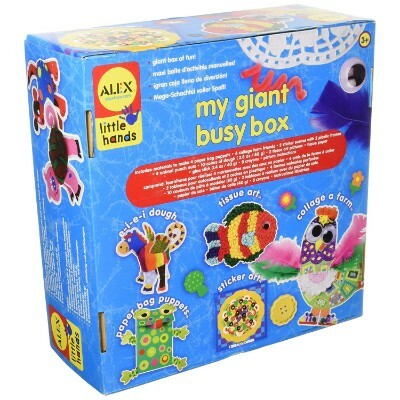 It is everything that says it is: a giant busy box. Included in the box are all the materials that are needed to create up to 16 different projects. Let them mold a dog, create a farm college, and make a paper bag puppet. Some of the materials included are; buttons, dough, flowers, eyes, bags, frames, doilies, paper, boards, and so much more. It also features some instructions to help guide kids in creating something great. The kit is best for kids over the age of 3 years old. Some creativity, a bunch of crafting materials, and positive directions allow kids to be able to express themselves. This set includes enough materials to create some fun projects that little ones will love doing. The instructions included inspire a creative direction, but the rest is up to them. It is a fun rainy day activity that will keep them engaged for hours. Creating fun wall art is easy with this kit. Once you help the kids get started it is a great kit to just let them explore and create something awesome on their own. This is an easy and fun craft. String crafts are so interesting and allow kids to creatively express themselves with some simple materials. 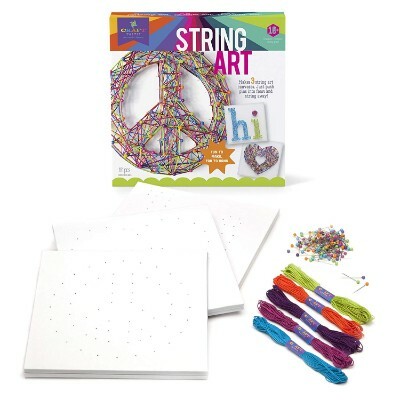 This kit includes 3 different foam square canvases to create string art on along with all the materials to create the designs. The set does feature templates for helping to design the art or it also allows little crafters to create their own design. No hammer or nails are needed just simply press the pins into the foam board to create the design and string away. Once the string art has been completed they make awesome decorations to hang up in their rooms. 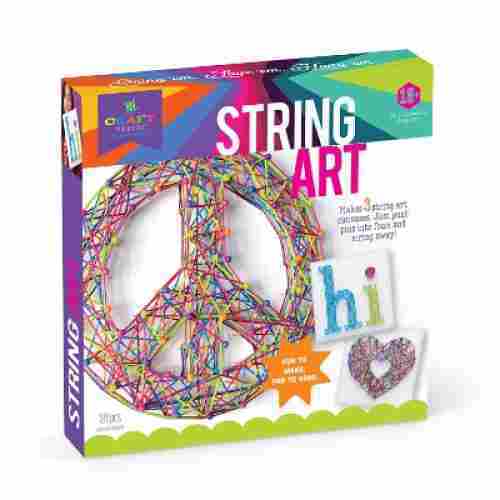 Art created with strings is one of the most interesting crafting activities that kids will have. These sets include everything that is needed for kids to sit right down and start creating a fun display. 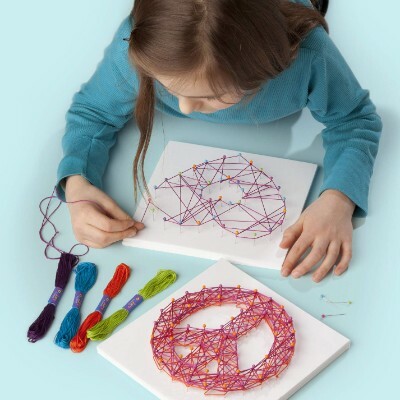 The cool string art that they create is a great way to encourage sensory system development. The pushing and pulling as they create something cool right before their eyes are amazing. Our team searched the internet and reviewed a plethora of sets for kids. After exhaustive research, they generated the 10 best sets for 2019. We based this list on ages, functionality and how well-built the kits are. Some of the sets on the list are perfect for children just old enough to hold a crayon. 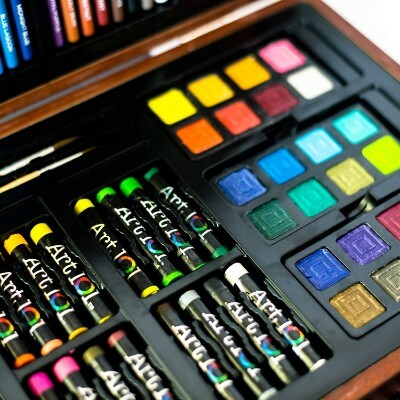 Other sets are for slightly older kids who are exploring new color mediums and may want to take their kit on the road. Then there are the truly adventurous, the ones who need the tools to capture the elusive images in their thoughts. Then there are the ones who may need some encouragement to develop creative skills. Each of the kits has been reviewed to ensure that all the materials included in the kit are of the highest quality. Quality materials to work with are very important. There is nothing worse than sitting down to create with your child to realize that everything has not been included in the kit or that the kit has included materials that are less than what you expected. Along with quality materials, we want to make sure the kit provides children with an engaging experience, an experience that provides them with a period of time they are able to focus on a task while using their developmental skills. As kids get a little older, they can upgrade to larger kits. The 142-piece wood art set is for children who are already enrolled in school. They can learn responsibility because these kits are larger and have the potential to lose pieces if they don’t practice being tidy. There are many benefits of engaging in these projects, but one of the major benefits is to get people off their phones and provide them with a positive social experience. The projects these kits on our list offer is an easy way to provide young ones with an activity that allows them to express themselves’ creatively in a positive social experience. 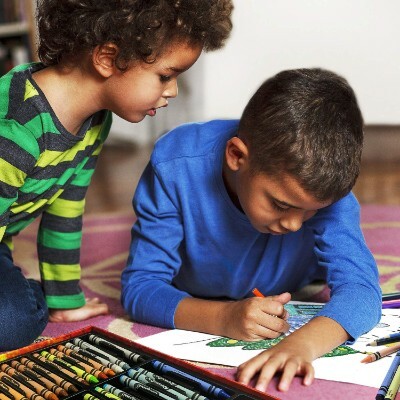 Whether children are creating at home with their parents or in a group of their peers, it is a social experience that allows them to engage with friends over ideas. This also creates a unique experience that they would not usually engage in. Projects like these create a natural environment to converse in and help spark their curiosity of what others create. It creates a social scene that is easy to engage in. Your child’s self-esteem levels will rise as they complete each craft. By working on the crafts with your child, you will not only bond with them but also improve their social skills. Children often use art as a form of self-expression and as a way to communicate their feelings, thus it is highly important that you give them free rein to create their pieces. It is also important that you remember to enjoy the process, despite the mess. The glitter can be vacuumed up later, for now, enjoy crafting with your little one. q: What is the best way to encourage children to participate in an activity? Often, children need a little encouragement to create because they may find it boring at first, but once they start, they usually love creating. It is recommended for parents to sit down and help them get started as this often helps encourage them to participate and try something new. q: Are there other things kids can draw on besides the usual paper or in a coloring book? Yes, set up a dramatic play that interests them. For example, set up a pretend shop that needs a new sign. Or make paper airplanes that they can color on. The idea is that the activity is relatable to what they love best in order to encourage coloring and drawing. q: If I feel like I have terrible art skills, should I enroll my 3-year-old in art class? Is it too early? It is a bit too early to send a 3-year-old to art class. Don’t try so hard to teach a tiny kid how to draw the perfect elephant. At that age, it’s all about having fun and learning how to enjoy drawing and expressing yourself. If both parent and child are terrible artists, that’s O.K. Just remember, it’s about having fun and exploring. When they are a little older and develop a love of drawing, enroll them in classes to enhance their talents. q: Are all crafting kits safe for a 4-year-old? Not all kits are safe for 4-year-olds, but most will be. It is suggested that children under 3 not engage with kits with small pieces because of the choking hazard, but by 4 years old, most children grow out of that stage. The easiest way to know if the kit is safe for a 4-year-old is to check the manufacturer’s suggested age group. All toys and kits must have this information included on their labels. q: Where can I find the kits listed on this page for sale? Being able to find the kits listed on this page is easy. All you have to do is click the link below the picture. The link will take you directly to Amazon where the product can be purchased. q: Are there different drawing stages kids go through? There are four stages of drawing and writing that kids go through. 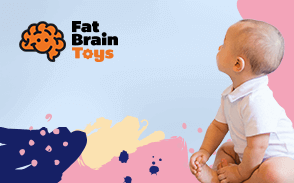 The earliest stage starts as young as 15 months old to 2½ years old. That is the random scribbling stage, where you’ll have no idea what they’re trying to draw, but that’s fine. They’re exploring different colors and practicing fine-motor skills. Between the ages of 2 and 3 years old, they go through the controlled scribbling stage. That’s where their drawings start to make a little more sense. To learn more about the different stages, check out this article. q: What are the healthy ways to advance kids early interests in art? Don’t buy them complicated 3D animation software, they’ll learn to hate you. And don’t encourage kids by telling them they are the best and that one day they’ll become the greatest artist in the world. That will fill their heads with dreams of grandeur and fame. And resist the urge to judge your kids' paintings. What is important is the understanding that it doesn’t matter how good their works are. At a young age, the most important lesson is the love of art. Skill will come in time if the passion and love are there. It is one of the best enrichment activities that you can purchase. It provides children with the opportunity to foster fine-motor skills and cognitive development. This beneficial to their overall development and provides a relaxing activity to express themselves. q: Should parents draw something for their kids to copy? Surprisingly, no. At a young age, children need to learn the love of drawing. When a child is shown how to draw then they are learning to copy drawings. If a child wants to draw something they see on a table, then use your finger to outline the object. This teaches kids to draw in the air by pointing their finger and outlining the object. Resist the urge to draw on their paper and instead help them learn by studying the thing or animal instead.